Robert Gordon University (RGU), Scotland, is working closely with industry partner, The Underwater Centre, to incorporate a commercial diving familiarisation course as part of its MSc Subsea Engineering and MSc Offshore Oil and Gas Engineering courses. The Centre is delivering theoretical sessions covering diving physics, diving physiology, gases and diving systems, diving regulations and ROV intervention using the extensive facilities and subsea equipment. 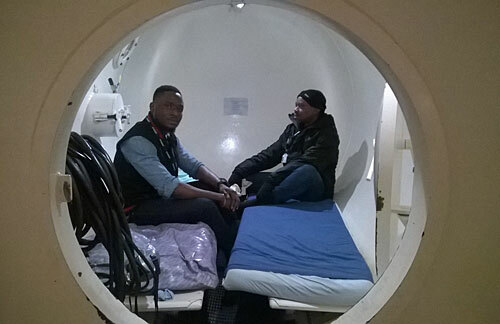 The latest students to benefit from this industry collaboration, Felix Daboner and Joseph Adele, visited the Centre in Fort William last month to complete the week-long course, “The Oceans, Operability and Humans In The Ocean”. Each day began with classroom based theoretical training sessions before visiting the Centre’s various dive sites including the Surface Supplied Nitrox Diver Training Site, Surface Supplied Diving Sites and finally the Saturation Diver Training Barge. The students also toured the Centre’s Recompression Chamber facility and ROV training spread. This practical exposure reinforced the theoretical training making it a unique learning experience for RGU’s students. The courses combine academic engineering study with current, real-world industry practice. This is achieved by combining the strengths of the School of Engineering’s full-time staff with the knowledge and skills of industry specialists and visiting lecturers, providing access to world-class teaching and research.